Joe Cyganowski-For Shaw Media. 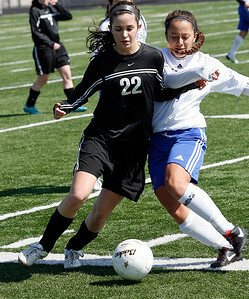 Going to the air Cassie Warton Prairie Ridge (left) and Ale Alonsa collide. The Prairie Ridge High School girls varsity soccer travels to battle the Hawks of Hoffman Estates. Joe Cyganowski-For Shaw Media. 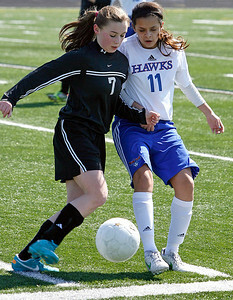 Allyson Walsh (left) Praire Ridge and Natalie Pena Hoffman Estates chase down the loose ball. The Prairie Ridge High School girls varsity soccer travels to battle the Hawks of Hoffman Estates. Joe Cyganowski/For Shaw Media. 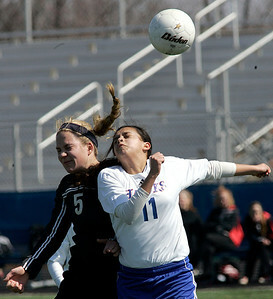 Praire Ridge's Caitlyn Fenton (left) and Hoffman Estates' Ale Alonsa chase down the loose ball. Saturday, March 23, 2013 in Hoffman Estates. Joe Cyganowski-For Shaw Media. 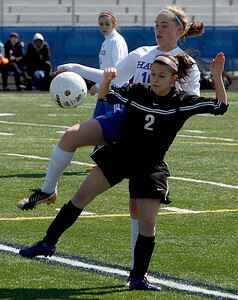 Jessica Miller Hoffman Estates pressures Larissa Dooley Prairie Ridge as they battle for the ball at midfield. The Prairie Ridge High School girls varsity soccer travels to battle the Hawks of Hoffman Estates. Joe Cyganowski-For Shaw Media. 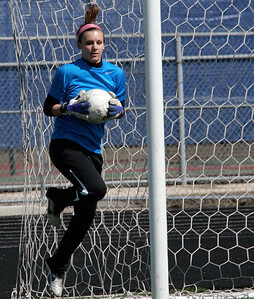 Prairie Ridge keeper Whitney Whitehouse pulls in a shot on goal. The Prairie Ridge High School girls varsity soccer travels to battle the Hawks of Hoffman Estates. Joe Cyganowski-For Shaw Media. 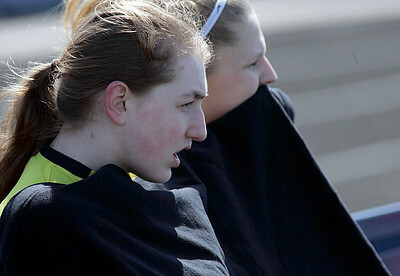 Despite heated play sitting on the field, on the bench Brooke Laibly (left) and Emily Barnes of Praire Ridge keep bundled up. The calendar may have heralded the coming of spring, however, for the high school sportsman it's nothing but the cold shoulder. The Prairie Ridge High School girls varsity soccer got to play their first game on the artificial turf of Hoffman Estates High School. Joe Cyganowski-For Shaw Media. 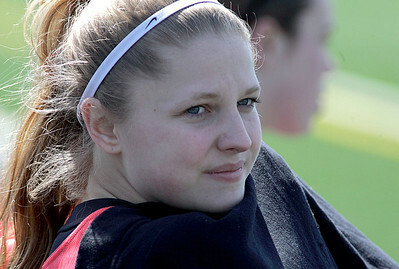 Prairie Ridge Emily Barnes keeps bundled to fend off the cold.The calendar may have heralded the coming of spring, however, for the high school sportsman it's nothing but the cold shoulder. The Prairie Ridge High School girls varsity soccer got to play their first game on the artificial turf of Hoffman Estates High School. Joe Cyganowski-For Shaw Media. 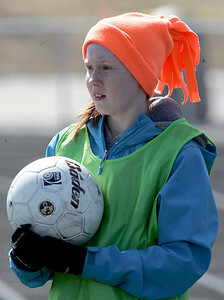 Ball girl Anna Miller staves off the cold in colorful fashion. The calendar may have heralded the coming of spring, however, for the high school sportsman it's nothing but the cold shoulder. The Prairie Ridge High School girls varsity soccer got to play their first game on the artificial turf of Hoffman Estates High School. Joe Cyganowski-For Shaw Media. 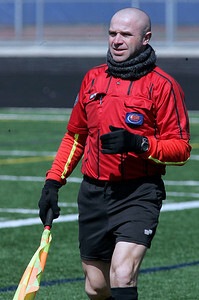 Undeniably the stauchest of officials this linesman keeps warm along the sidelines. The calendar may have heralded the coming of spring, however, for the high school sportsman it's nothing but the cold shoulder. The Prairie Ridge High School girls varsity soccer got to play their first game on the artificial turf of Hoffman Estates High School. Joe Cyganowski-For Shaw Media. 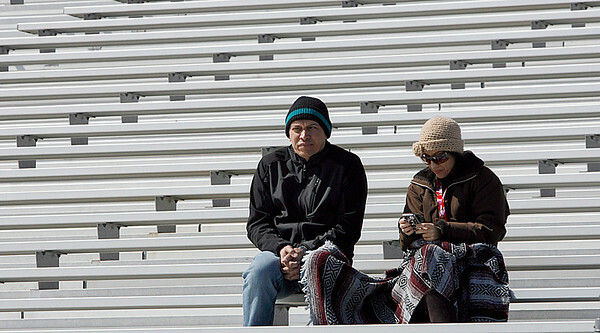 High school girls soccer fans are the unsung heroes of the sporting world, Ariel (left) and Iris Reyes of Crystal Lake brave the cold to watch the game. The calendar may have heralded the coming of spring, however, for the high school sportsman it's nothing but the cold shoulder. The Prairie Ridge High School girls varsity soccer got to play their first game on the artificial turf of Hoffman Estates High School.